Vacation mode continues at Date Yourself Radio. 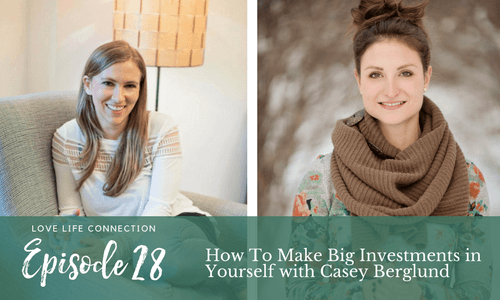 This week, Casey + I are talking about how to make big investments in yourself. Investing in yourself is SCARY business. Yes, it could be a lot of time + money, which is scary. But it’s also scary because you’re investing in yourself because you want something to change: your weight, your happiness, or your dating life. And even though we may want something different than what we have, there is a comfort in staying where we are EVEN if it’s not what we want. Does work/life balance really exist? For many years Casey had an unhealthy and unhappy relationship with food, her body, and her life. She is a self-described queen of the all-or-none when it came to food + dieting. She read every diet book she could get her hands on and ate in a very rigid way (that would usually backfire). This left her exhausted + feeling stuck. She got her degree in nutrition from the University of Alberta, which was useful in learning how food affected her body. But what REALLY helped her was establishing a yoga practice. Yoga helped her let go of her perfectionist mentality + made her more mindful. It connected her with her own unique inner wisdom, which now serves to guide the way she eats, the way she treat her body, and the way she lives her life. -JOIN US! Are you in the Date Yourself Facebook group? It’s THE place to be to get support for authentic + intentional dating. -If you get value from Date Yourself Radio, please rate & review it in iTunes. It only takes a sec to impact our ranking + it’ll help other women find our community!